Aveeno Positively Ageless Night Cream Reviews: Is It Really Good? Avon Anew Clinical Professional Cellulite Review : Ingredients, Side Effects, Detailed Review And More. What Is Aveeno Positively Ageless Night Cream? Aveeno Positively Ageless Night Cream is a face and neck cream that helps fight signs of aging as you sleep. It is sold and manufactured by Johnson & Johnson, which owns the Aveeno Brand. Although you need to add sunscreen after applying it as it causes skin sensitivity. Hydrolyzed Wheat Protein: Decreases the look of pores on skin and nourishes the skin. Mauritia Flexuosa Wheat Oil: Contains fatty acids, vitamins C and E, and beta-carotene. Hydrates skin, protects it from further damage, and promotes firmer skin. Lentinus Elodes Extract: Extract of shiitake mushrooms. Could also sensitize skin. Shea Butter: Derived from the seeds of the African Shea tree. Absorbs UVB rays in order to protect skin from the sun, conditions skin, and mimics natural skin oils. Algae Extract: Contains vitamins A, B, C, and E, which are rich in antioxidants, protect skin from the sun, and promote the production of elastin and collagen. Dimethicone: This ingredient works as an anti-foaming agent. However can actually increase skin irritation. Apply on each night on clean skin. The product contains an AHA (Alpha Hydroxy Acid) that could increase skin sensitivity to sunlight. Contains ingredients that are rich in antioxidants, vitamins, and fatty acids known to benefit the skin. This product helps accelerate the skin’s natural renewal process. Suitable for all skin types. Although some customer reviews state that it causes irritation. Aveeno Positively Ageless Night Cream contains an Alpha Hydroxy Acid (AHA) that could increase skin sensitivity to sunlight. Sunscreen must be used during the day when using this product. 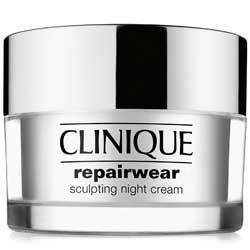 Though the cost of the product is affordable compared to other anti-aging creams in the market, return and exchange terms vary. Even though the product’s ingredients are listed on its label, the amounts aren’t. The manufacturer does not provide links to information that backs the claims made on its website, but says it is proven to provide results. 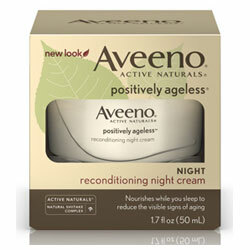 Aveeno Positively Ageless Night Cream is an anti-aging cream that helps fight the signs of aging when used at night. It contains many ingredients that are rich in nutrients and antioxidants known to benefit the skin. 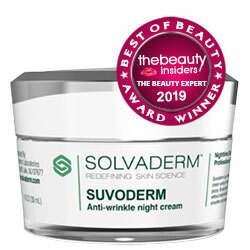 Its manufacturer is Johnson & Johnson, which is known for providing affordable skin care products that are available in a variety of retailers around the US, as well as online. 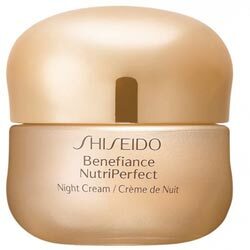 People who use this cream should ensure they wear sunscreen during the day, as the cream contains an Alpha Hydroxy Acid that could increase their skin’s sensitivity to the sun and negate benefits from using this cream as a part of their daily routine.